What bridesmaid gifts have people gotten that they liked? Trying to figure out what to get my bridesmaids that will really be appreciated. Looking to spend between 50-100 and they are all flying in from various places, so can’t be something hard to transport (ie, alcohol is out). I had considered getting everyone one of those silk/cashmere wraps from Nordstrom, but some concern those don’t “look” as nice as they are (I can’t tell much of a difference in the “pashminas” I bought on the street in NYC and the Nordie ones). I was leaning toward not jewelry as for the most part they are not really big into jewelry, but having a hard time coming up with other ideas. Are you already offering to pay for their hair and/or makeup for your wedding? I have always appreciated when brides did that. In the alternative, if you want to give them a physical gift, I have always read that it’s best to treat it like any other gift-giving occasion and give each one something that she would really like, not necessarily trying to match the gifts. (Though maybe matching approximate cost). Good luck! I second this – I think it’s really nice when the bride covers a manicure or hair appointment rather than giving a generic gift. (Even the one instance where I did receive a gift that was individual and well thought out, I still probably would have preferred that she cover our non-negotiable hair and makeup appointments that she had booked for us.) Being a bridesmaid is expensive! I seriously had no idea that people would book hair/ makeup sessions and then make you pay for it. I don’t even do that for myself (I mean, I get my hair done maybe once a year, but it’s the person who does my hair anyway and not that pricey to add on to a usual trim; but never makeup). YIKE$! What do these things usually run (recognize this is location-specific, but I’m almost scared to ask at the day spa)? Last wedding I was in, it was $75 each for hair and makeup. Agreed. When I did this, I purchased Kindles for 2 of my attendants who traveled a lot and were also big readers. Seemed like a fairly non-traditional bridesmaid gift, but I knew it would be something that they really enjoyed (and they did). Yea, doing that and also bought their dresses. Thank you, on their behalf. The last time I was a bridesmaid, I maxed a credit card buying a dress and plane ticket and then spent my last $30 on a hairdo I hated. I was in grad school and completely broke. Make up bags? Passport covers if you know they travel. Kate spade surprise sale is on now and there’s a few cute things. Avoid jewellry. The only times I’ve gotten it as a BM gift, it wasn’t my style and I’ve barely worn it. Honestly I think the best gift is paying for the dress. If that’s not in the budget, paying for them to get their hair/makeup done is nice. I disagree about doing different gifts for different people – maybe my friends are unusually immature, but that seems like a recipe for hurt feelings and drama. I think it can work if you give everyone a similar necklace but in different colors you know each one likes or something like that, but I wouldn’t give someone a necklace and someone a passport cover even if the costs are roughly the same. One of the most thoughtful bridesmaid gifts I’ve received was a gift certificate to a local spa in my city. I was touched that she spent time researching spas — and it was a good reason to indulge once I got back from the craziness of the wedding! My sister asked her bridesmaids to wear matching pearl earrings so she made those her gift. They were real pearls on small wires and were really pretty. The favorite gift I received from not my sister is a small pewter box I store odds and ends in. It’s about 6″ diameter and is just pretty. It’s on my mantle. 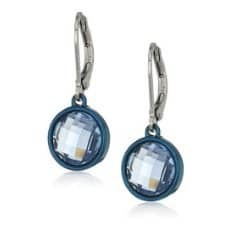 Matching earrings are a great idea, but I would urge anyone considering this to be mindful that some people have metal allergies, and the reactions from those sensitivities can be miserable! And some people don’t have pierced ears! I don’t and I wouldn’t pierce them just to wear earrings in a friend’s wedding. Yes, she got them on 14k wires. I still wear them all the time. I can’t wear costume either. And if it’s matching and the purpose is to wear at the wedding– it’s not a gift! It’s for you, not for them. Signed, have been gifted matchy-matchy jewelry at about 5 weddings and never wore any of it again. Simple pearls that I could wear again – i would consider a gift. The green rose earrings that matched the dress and dyed shoes – not a gift. One friend gave me a set of makeup brushes. They’re not super high quality, but I put them in the makeup bag I keep at work and use them pretty frequently, so that’s appreciated. Another friend gave me an envelope clutch, which was perfect because I forgot to pack any purse besides my laptop bag that weekend. But I also love it and use it probably once a month, almost five years later. And I agree-I’d much rather have hair/makeup/manicure paid for, especially if I’m not allowed to do it myself, than receive a gift. 15 years later, at least two of the four are still in use. Honestly, the best gift by far would be to buy everyone’s dresses. I’ve never liked a bridesmaid gift, they just go into a pile of clutches/bags/etc that I never use, and jewelry is never my taste. Buy the dress, hair and makeup. Hair, makeup, hotel room, rental car, something to ease their financial burden. Nice costume jewelry set (think in the $40-$60 category) picked based on what the bride thought each bridesmaid would like best/tailored to personality. I picked up the hair/makeup/bridesmaid dresses anyway, but for the “day of” gift I got everyone cute matching robes that we could wear in the getting ready pictures. People still wear them (I got just generic floral ones, not anything that said “bridesmaid” or anything like that. One of the best gifts I’ve gotten of that type was a large quilted toiletry bag lined with plastic. I use it every time I travel. She also had it monogrammed for me. It packs perfectly on the top of even a small suitcase. I paid for bridesmaids dresses, hair, and matching robes for getting ready pictures. The only benefit to receiving jewelry imo is that if I hate it, I don’t have to feel bad about buying it myself just for your wedding (I mean jewelry the bride wants worn at the ceremony). I second all the suggestions to pay for hair/makeup/nails/attire if at all possible. I am a minimalist and don’t want more stuff, even if thoughtfully picked out. Second everyone saying to contribute toward some of the day-of costs if you can– I regret not doing that. I gave my bridesmaids Coach wristlets/wallets/small bags in a color or pattern that seemed like something each friend would like (not my wedding colors). They went over well and still get used frequently. Gifts I’ve received and liked: a nice leather makeup bag , a small mirror jewelry box. Gifts I’ve never used again: robes, hoodie, matching costume jewelry. I don’t mind wearing that stuff if you want it in your photos but it’s not really a “gift” for me. Remember that these are individuals whom you love. Get them each something individual. Pretend it’s their birthday. Don’t get matching gifts (which say you couldn’t bother to take the time to select a gift for each of them after they’ve likely done a lot for you). And definitely don’t get them something to wear in the wedding, which is just a photo prop for you, not a gift to thank them. I got my bridesmaid who did photography a nice leather camera bag (with a gift receipt since it’s such a personal item), and my cooking enthusiast brother (my “bridesgroom”) a gift certificate for a knife skills he’d said he wanted to take along with a cookbook. … and I meant my bridesmaid who DOES photography, she didn’t do our wedding pictures! I loved getting a Swiss army knife and use it all the time several years later. We didn’t have to buy dresses or do professional hair/makeup though; if that were the case I’d rather have the bride pay for that. TBH – jewelry. I’m not into it either which means I don’t buy much. Which means bridesmaid gifts I’ve gotten consisting of a simple earring and necklace set or a simple necklace that goes with everything are invaluable and get worn all the time and I definitely remember who gave it to me. Less so with a wrap that’ll go in the closet and be used 1-2 times in life. Something like this? Different stones for different bridesmaids, perhaps? That’s nice but I’d never wear it because I don’t like yellow gold. Too many preferences to try and navigate unless you have a tiny bridal party. I hang most of my laundry on an outdoor clothes line to dry, but not my undies (don’t need the world to see those). Can tights go outside, or should I keep them on the indoor rack (which is a major pain, and already mostly full of bras)? I hang my tights over my shower rod. This is entirely up to you and your comfort level. I hang everything outside! Huh? There aren’t rules about this . . . So I had posted last week – on day 7 of meditation with Calm. Kind of shocked I’m sticking with it but it seems like the “anxiety loops” (idk what to call it when you think what if and then start thinking worse and worse stuff) are kind of breaking. I find myself not “thinking/worrying” all the time – even at work or just sitting around. Setting small goals – like continuing for 10 straight days. Right now it’s averaging out to 15-17 min a day though across many small sessions – like 1 10 min session and then lots of 1-2 min. is the Calm app free or is there a charge? There’s a charge — you get a couple for free but if you want them all you pay. I use it too, do the daily meditation at night before bed. Insight Timer is free and has all sorts of timed things, guided and musical, and a timer with rain or water sounds and stuff. There isn’t much of an intro, but I don’t think you really need to start at Step 1 or anything, just try it. I read the first sentence of this too fast and went, “You’re CALM after SEVEN DAYS of mediation?” I guess you can tell what I have been doing lately . . .
Are you getting paid by Calm? That’s exactly where my brain went, too. To me, there is nothing better than sleeping in a freshly made bed with the sheets tucked in tightly. DH, of course, can’t stand the feeling of tight sheets around his feet and kicks his feet out / untucks the sheets in the process. This results in the entire sheet becoming untucked, on my side as well. We can’t be the only people who have this disagreement. Does anyone have any life hacks for this? I’ve seen readers here suggest two flat sheets, sort of overlapping. He can do what he wants on his end, and you on yours. We do this but with 2 comforters. Sleeping under the same set of covers is overrated IMO but I think everyone assumes you have to do this. We just implemented the Scandinavian/Germanic “two twin duvets instead of one big duvet” and my sleep is so much better. We have different temperature preferences and he’s a blanket thief, and it solves both problems. Probably not what you want to hear, but we had this same issue (as well as other disagreements about bedding and sleep environment) and and eventually our solution was to sleep in separate bedrooms. Most of our friends/family don’t know because I still feel like there’s a lot of stigma to sleeping separately but it works great for us and I don’t feel like our marriage or emotional intimacy have suffered. He sleeps on top of the sheet? This is what DH and I do. Also, he sleeps with a quilt, I use a duvet because I’m the blanket thief! weighted blanket for you (tight tuck lightly creating a similar effect) and a twin sized duvet + cover without top sheet for him? We don’t use a top sheet at all. King size bed and we each have a twin sized duvet and we change the cover every week when we wash the bottom bed sheet and pillow cases. DH’s duvet is like 25% the thickness of mine. I’m thinking about switching to a weighted blanket though as they are supposed to be great. Other option is to buy two twin mattresses to put on top of your king sized boxspring. You can tuck the sheets down in the middle for you so you get a nice tight tuck. We are the opposite, but yes. We have a queen bed and we hospital tuck of the comforter and flat sheet on his side while I leave mine out for air. It works fine. Oh, we have a king duvet on a queen bed which allows for more footage for each of us. This is us. I just re-tuck his sheet every time I make the bed–would love a better solution here! Yeah, this is us too. My husband also sleeps like a maniac. It looks a hurricane hit his side of the bed when he gets up in the am. Not only is sleeping uncomfortable, making the bed is a PITA. We are reaching a breaking point, and considering getting two separate full size beds and putting them in the same room. We’d both sleep better and I can’t see how it would negatively impact our relattionship, but I still feel a stigma. I’m laughing so hard at “my husband also sleeps like a maniac”. I often describe my SO sleep habits like that. He’s the only person I know who can manage to wiggle off a pillow case while sleeping on it! Do it!! You know what ruins a relationship? Lack of sleep, and resentment from lack of sleep. There used to be a product like this in an infomercial as I recall. Essentially it was a split sheet that had a longer ‘tail’ on one half so that the one side could be tucked. I believe this is an issue with adjustable beds, so maybe search along those lines. I do recall thinking that the sheet didn’t look like anything special and like it could be easily made or hacked with just buying an extra long sheet and not tucking one side. OMG! Are you me?! My husband does this and it drives me nuts. I like the idea of having two separate sheets and/or comforters, but honestly, that is just double the work to make up the bed. He balls the covers all up, too. Ugh. We switched to the Scandinavian double sheets/blankets, so no one steals sheets etc. Does anyone here have experience with carrying a healthy pregnancy despite a MTHFR mutation? I just learned that my family has a pattern of this mutation, which inhibits proper conversion of folic acid (aka the key component of pre-natal vitamins). Planning to TTC this summer so wondering if there are specific things I should be on the lookout for or speak with my doctor about, but the online resources seem to skew towards the tinfoil hat crowd. I am not a doctor, but the internet says 30-50% of people have this mutation so I can’t imagine it would prevent you from carrying a pregnancy to term. In the long run, I think you’re probably right. I am also not a doctor, but it seems like one of the significant issues can be miscarriage. Given how common that is, it wouldn’t surprise me to learn that a lot of people had navigated pregnancy loss as a symptom of the double mutation. I’m in a natural parenting group in my area as I lean hippie in most things but the popularity of MTHFR stuff is hooey – that and PANDAS are the new anti-vax crowd thing. Just waiting for the next crop of spina bifida resurgence once they convince enough women not to take folic acid. take your regular pre-natal. eat a varied diet with lots of fruits and vegetables (so you get natural folate sources) and you’ll be fine. To be clear – I’m sure that this is a legit issue for you and your family but you’re not wrong that a lot of the stuff online is tinhat crowd stuff. Stick to CDC/Mayo clinic recommendations and you’ll be fine. I don’t even want to know what PANDAS is, but I guess someone’s doing a good job coming up with catchy names for these things. And thanks for the reassurance. I have a close female relative banging the MTHFR drum about some legitimate health issues she and her mother experienced, but I figured y’all would be able to advise on whether this was worth my time or not. Sounds like not! i just read a little bit more about this. the gist seems to be that getting adequate folic acid has a much greater effect on pregnancy outcomes than MTHFR status. This is a thing in my family too (for generations before we knew why). My understanding is that the concern is that folic acid may pose some risks if your body can’t process it correctly. As far as I know, we don’t have clear answers on this yet, but we are curious whether common MTHFR genetic variance explains why folic acid supplementation during pregnancy sometimes appears to be a double-edged sword. So if your body doesn’t handle folic acid well, you would want to avoid eating foods fortified with folic acid (e.g. certain breakfast cereals and breads). I don’t know if they’d let you just track your diet to make sure you are getting enough folate from food, but you could look into taking a prenatal formulated with methylfolate instead of folic acid (and with methylcobalamin instead of some other form of B12) at an appropriate dose. I don’t think there is any hard science supporting most of those claims, but in the meantime, why not get tested yourself? It may be a non-issue anyway. Two. Both planned, conceived when wanted, natural births. No miscarriages, ever (I’m way past my child bearing years, but only used hormonal birth control for a handful of months in my life). I didn’t know I had the mutation until my youngest was 2 and I had a PE. My dd also carries the mutation, we had her tested as a young adult. So it influences her choice of birth control, and she takes a FABB vitamin. This discussion is always confusing because the words “folic acid” are often used when people mean “Vitamin B9” or “folate.” Folic acid (pteroylglutamic acid) is a synthetic folate that was first created in the 1940s. It’s different from the forms of vitamin B9 that occur in food (there is no pteroylglutamic acid in food). No one disagrees with this. This is all hard science. Leaving aside the debate over gene mutations, I don’t think it is right to say that folic acid is the key component of prenatals–it’s folate that matters, and folic acid is not the only way to get folate. Interesting question, because I recently tested to definitively have a homozygous MTHFR defect, which means my mom has it too, and we’ve been discussing whether this is the latest medical fad. It seems like there might be a lot of unreliable sources out there on the internet…and yet I’m going to add in another. Because no one has yet mentioned info that I got. Talking to a psychiatrist, I was not told anything about having too much folate or folic acid or vitamin B9. I was told that I have a deficiency in the methylated forms of the vitamins, which most people’s bodies can create from the basic version. So I need to supplement with special forms. Considering how carefully I have to read the labels to find the right kind, I doubt a standard prenatal has the methylated form. By choice, I’ve never been pregnant. But my mom had 2 miscarriages and a stillbirth, as well as 2 healthy births. Which is just anecdata, and may have nothing to do with MTHFR. But yeah, if I were you, if it runs in your family, I might get tested (it’s just a cheek swab) to see if I needed some extra vitamins. I have the mutation, and lost a baby. you cannot take folic acid as your body can’t deal with it, you need to take folate. if you take the right amount (and for me it’s 2 g a day), then a successful pregnancy can be achieved ( I did). Please help me – I’m fashion challenged. I bought the J Crew blazer featured a few weeks ago, and it is beautiful. (Link to follow) However, the sleeves are short, and it’s listed as having “bracelet sleeves”. Please explain to me if this is something that is in fashion or if it’s just something that looks weird. The sleeves hit me right where a bracelet would sit. Otherwise the fit is perfect and I don’t think sizing up would mean longer sleeves. Bracelet sleeves are a thing. They don’t really go in or out of style, they just exist. (Like 3/4 sleeve things are just a thing.) If you don’t love the length, can you cuff the sleeve to make it more 3/4? If it really bothers you, you may have to return the jacket. Alternatively, depending on how it’s made, there may be enough material for a seamstress to let the sleeves down. Bracelet sleeves are a real thing! I love them, I think they look kind of retro and elegant. my understanding is bracelet sleeves are just a shorter sleeve (a traditional one is longer maybe mid-hand I believe). the jacket is beautiful and sleeves may be a touch long/short for you depending on your arms. does this bother you? Bracelet sleeves are *supposed* to hit you right wear a bracelet sits. Hence the name. Yeah I get that. But what I can’t figure out is if this just makes me look like I bought a blazer with too short sleeves or whether it looks intentional. It looks intentional unless the sleeve is too long to be a bracelet sleeve (on you) and looks like a too-short full sleeve. If this is the case, have the tailor hem the sleeves a bit shorter. Can I get 2 hotel bills for the same hotel room but different nights? We want to extend our stay at a conference hotel, and work is paying for 2 of the nights. For various reasons, it would be easier for us to have 1 bill with the first 2 nights, and then another bill with the second 2 nights. I’ve merged reservations with hotels before, but that’s the opposite where it’s 2 bills merging into 1. Yes they will do this. You can check out and check back in under your own card, or just ask them to split it when you check out for good. Yep, you absolutely can. Just let them know when you check out. Yep, it’s totally do-able. Just let them know in advance. I have only ever had to move rooms once. I just did this. Correct on checking out the morning after the conference and immediately checking back in with your personal credit card. Just be sure to mention this when you are making reservations and make it clear you want to stay in the same room. I went to see the Obama portraits in person this weekend. Did anyone not like them or think that Obama’s wasn’t dignified enough, especially compared to the portraits of his predecessors? That was not my reaction, fwiw. I was chatting with a colleague about it and wondering what others’ reactions were. To me, “not dignified enough” is a thinly veiled dog whistle for “not white enough.” Which is what was said pretty frequently about both Obamas throughout his presidency, so saying it about the portraits is just par for the course. Ymmv but I would push back on that framing. That was my feeling and I just….. wasn’t sure if I was making too much of it or seeing things that weren’t there. This guy is my peer and I don’t this kind of thing will be a problem with most people in my firm, but it sort of made me feel like people will see me (to the extent that I differ from some idealized image of what’s “professional” or whatever) and just think that I’m not good enough, not professional enough or whatever. Anyway. Thanks for the input. Also, to give your colleague the benefit of a doubt: it is important to remember that the portraits in the Smithsonian are not the same as the official WH portraits, which are typically much more formal and, for lack of a better word, staid. I think what I said in the moment was that I think breaking with the stylistic choices of the past was a good one and it’s time for our public view of “what’s dignified” to be a bit more inclusive. *sigh* longer comment got eaten. That was my feeling too, I just wasn’t sure if I was being…… oversensitive and seeing everything through that lens. Thanks for the validation. I get where you’re coming from: previous presidential portraits have had backgrounds that include globes, heavy curtains, and other trappings of authority and power. The portraits have changed over time as our notions of formality have changed. Obviously no one is dressing like George Washington, but no one was even pictured smiling until Eisenhower (probably considered undignified). This is a pretty big shift in presidential portraiture but one that reflects the times in which we live. I think my other comment about this is in moderation, but actually, these aren’t the right portraits for comparison. The WH portraits are much, much more formal and have basically no styling. These are done while a president is in office and are displayed in the WH. The Smithsonian portraits, on the other hand, are usually unveiled after a presidency has ended and are really pieces of art. Especially in the late 20th century, these got really stylized and abstract–look up JFK’s, Clinton’s, GWB’s. Obama’s is well in line with that tradition in all ways except melanin. Did not know this, thanks for the link! +1. The Smithsonian portraits are meant to showcase contemporary artists. Kehinde Wiley is a prominent artist. If your colleague thinks the portrait is not dignified enough, he doesn’t know much about art. Dignity is a major theme in Wiley’s work. +1 – Bill Clinton’s is FAR more cutting edge than the Obamas. And George W. Bush didn’t wear a jacket. Most of them are of the president in question sitting or standing in a chair, usually in either a generic or vaguely office-y setting. Obama is instead sitting in a chair in front of greenery. In what way does the change in background lack dignity? It’s a nonsense comment. I would push back on this framing too. I loved Obama’s, which incorporated his more relaxed and personable demeanor and touched on his background with the state flowers. However I strongly disliked Michelle’s. Facially it doesn’t even much look like her, and the gray cast was a poor choice. Very sick and dead dark skin looks gray, so the pallor just makes it a bit deathly looking (Source: relatives funerals and great grandparents). The gray tone is actually an intentional choice by the artist in all of her work: it is meant to present the subject outside the rather narrow confines of American Blackness. (Something with which MO must surely be very familiar!) You do not need to like it, of course, but know that it was not done lightly. I’m related to someone who painted one of the presidential portraits, and he felt that the Obama portrait did not capture Obama’s personality, specifically, his thoughtfulness and humor. He also disagreed with posing Obama sitting, but I can’t remember why. If it matters, he doesn’t like several other presidential portraits, and he’s also asked to have the one he painted back so he can “fix” it (the National Portrait Gallery has declined, twice). Looking through the presidential portrait exhibit at the NPG, I noticed that Obama and Lincoln were both seated in similar chairs and both were leaning forward in thought. I liked the parallel there because I know Obama was very inspired by Lincoln. I’m not an art buff, thought, and I have no idea if that was intentional, but that was one reason I appreciated Obama being seated. I think they’re both wonderful and also sort of meh. Wonderful because: they are exemplifying a wonderful purpose of art, in that they are starting conversations and allowing people to examine their own ideas about a concept. What does it mean to be “presidential”? What were these artists hoping to convey about these two people? A wonderful example of art that sparks debate and discussion and conversation but does not exist merely to shock or provoke – what wonderful pieces to have in the Smithsonian!! Meh because: I personally don’t like Michelle’s – most because I feel like her dress dominates the portrait and diminishes her in contrast. Barack’s, I like more and especially like the symbolism of the flowers, but still don’t feel fully on board with the overall look. I like Barrack’s, but I think Michelle’s is just plain old bad art. I don’t think it’s an objectively good painting, let alone a good portrait. I do get why people may not like the styles – other presidents are in casual poses but they’re still a very traditional style of painting versus the Obama portraits. Yea, I liked Barack’s, but my complaint with Michelle’s is I don’t think it actually looks like her at all. It almost looks like one of their daughters more than Michelle to me. Thank you ANON for the Athleta code! Alright, so: I am a survivor of domestic ^!olence. I left him before I went to law school. It was over a decade ago, and people who have known me for ten years don’t even know that I was married. I am mostly past it, but maybe twice a year I will be triggered by especially large men who get too close to me in a confined space (e.g. an elevator). Three months ago, my boss was on vacation. My boss’s boss and HIS boss asked me to come discuss a huge project with them. They are both over 6 feet and intimidating (everybody says so). We went into the highest boss office which is about 10 by 10 and let’s just say that I did not “perform” well. I mean I answered questions but in short form, curtly…like I said, I don’t really remember – I was just trying to get out of there as fast as possible. I just had my annual review and I am being told that if I don’t improve my “poor performance” then I will be let go in 3 months. My boss was VERY transparent with me that he thinks I am fabulous and he is being forced to do this by the two higher-ranking men that I mentioned. The interaction I described above is the only interaction I have had with these men. Until this I was considered a top performer and I was even promoted last year. I have 6 years of excellent feedback. HOW do I navigate this? Do I need to come clean about my humiliating past and beg HR to move me somewhere else in this (huge) company? Would that even be feasible? I have managed ok for such a long time by trying to build friendship with men who tr!gger me that I must work with, but in this case I don’t have exposure to them and frankly now that this is happening the thought of seeing one of them makes me want to burst into tears or worse. Let’s step back for a minute. What metrics have they given you to define improvement? What is it they want you to do in the next 3 months? Can you do those things? If your boss thinks you’re amazing, then a one-off event (can it not be attributed to nerves?) shouldn’t undermine your career. The cause and effect here aren’t making much sense to me – I’m not saying people like your grandboss and great-grandboss don’t exist, just that I’ve never seen higher ups care that much about an underling that they’d threaten to fire her over one meeting. This. One meeting didn’t likely do you in. You could just be a casualty of a larger office issue – e.g. we want to keep 4 people at xyz level and we have 6 people so we have to let two go. I wouldn’t disclose as it sounds like you would not be comfortable with people at work knowing. If a reference to the meeting comes up, note that you were very nervous as they are the big bosses and you didn’t do your best work. It’s normal to be nervous at a meeting with higher ups – chalk it up to that and no one will question you. Ask for specific metrics for improvement to meet over the next few months. Work with a therapist for techinques on how you can reduce your stress if you have to interact with them again – e.g. breathing techniques. I think you should first ask your boss if that specific interaction is the reason for the poor review. It wouldn’t make sense to tell him your background if that’s not even the problem. A you seeing a doctor? This seems like a medical issue. I will have a less extreme though still distracting reaction to being in closed spaces or without an easy exit. It stems from trauma in my past too. I have discussed it, vaguely, at work with success. In your case, I’d start with boss and say “hey, it occurred to me that I was struggling in meeting with big bosses because I get really claustrophobic in closed spaces like big bosses office. If possible, I’d like to meet with them in the future in conference room instead.” There’s a particular meeting room in a local court house I hate for the above reason. When opposing counsel offers to confer there I usually just say, that room is really cramped and uncomfortable, let’s meet in the downstairs (bigger) room instead. It usually works. I would suggest talking to your boss. Say that you had a meeting with the two higher-ups while he was out and that unfortunately you just weren’t feeling “like yourself” – “It was unfortunate; I was just feeling a bit light-headed and I don’t think I made a very good impression.” Then ask if your boss thinks that meeting is the cause of your poor review. You can also say that you’ve really wracked your brain to understand this feedback and that’s the only issue you can think of – if the meeting wasn’t the cause, could he offer some additional clarification around what was? Hugs, what a crap situation. I don’t want to tell you how to feel but I *do* want to remind that your ex treating you like that is not a reflection on YOU … to the extent some kind of embarrassment/humiliation feeling is holding you back from what you might say, I just want to underscore that you didn’t do anything wrong. Of course I’m not saying you’re wrong for wanting to keep it private (lord knows it can be necessary and even empowering)… sigh. I know this isn’t what you want to hear, but you have been put on a performance improvement plan, and this usually is a CYA before a company wants to terminate you anyway. You should focus all, and I do mean all, of your efforts on finding a new job in the next three months. If they have taken this drastic of a step, and you truly didn’t see it coming, then there’s a giant disconnect between their expectations and yours. You need to get out, ASAP, because, realistically, they’ve made this decision for you. Dust off your resume and cover letter and start networking. This isn’t about one meeting at all. This is about something way bigger and you need to not believe that if you just do “x, y, and z” by three months from now, everything will be ok. It will not be OK. You are being watched very carefully and are under the microscope to screw up. They are not looking for you to succeed, they are looking for you to fail. This is the first step in counseling you out. I am sorry if this is harsh, but it’s what you need to hear. Start looking now and leave on your terms instead of getting surprised three months from now. At no time have I ever put a direct report on a plan like this without consulting with HR, knowing that this is a last-ditch effort to get someone to perform where we need them to. Something at your work has drastically changed, and it may have been this meeting, or it may have been something else. Either way, you’re not in good esteem in this org, and it’s time for you to go. Linda from HR–care to chime in on this? You need to find a new job. Put all your efforts into that. You will never know if that one meeting was the reason. It probably isn’t. Don’t waste time on it. I have to go to a political event for St.Patrick’s day this year. Normally this is a before work event so I would just wear a suit, but this year the holiday is on a Saturday. Still suit? I’m thinking a step down but still on the formal side. Related: anyone spot any cute green tops I could pair with some skinny pants for this purpose? All my usual go-tos only have army or mossy green stuff. Looking to spend less than $50 and need quick shipping, shoprunner preferred. TIA! Can you explain more about the event? A St. Paddy’s Day political event does not sound like an occasion for a suit or really even business attire. Seems like a “roll up your shirtsleeves,” “one of the people” event. Yeah – green dress if you need to look a bit profesh? It’s breakfast event with our congressperson and other local politicians at a big bar/lounge. I’ve been once before and it was lots of local judges, city council people, etc. and most were in suits pre-work. I’ve been to plenty of this type of event, and I doubt that people will wear suits on the weekend. Your second option of skinny pants and blouse (nice business casual) sounds much more reasonable. On a Saturday morning of St. Paddy’s Day, I can almost guarantee you your Rep will be wearing khakis and a casual button down (with a fleece if chilly) if male or something Talbot’s/Coldwater Creek-ish if female. I will be visitng Houston the last week of the month and have not been before in early Spring? would it be accepable to wear pastels and light colors? Can I assume that white jeans would be ruled out? Texans dress for the weather, not so much the seasons. (Because they have 2 months of cool, 4 months of warm, and 6 months of hot as heck.) White jeans are acceptable year-round in Texas. It’s supposed to be 80* next week – dress for the weather. +1 also it’s not Dallas. No one’s going to notice what you’re wearing. +1 to 5:07, that white jeans are completely acceptable fashion-wise, though you might want to reconsider wearing jeans at all if you’re going to be outside much. It’s going to be too hot for pants, IMHO. and lol to Dallas burn at 5:26. IMO almond toe pumps are a classic. Might not be in style at the moment but won’t be frowned upon. I wouldn’t think twice about wearing them. Almond toes are a classic shape that is always in style. I wouldn’t think twice about this. I laughed when I read this…. Almond toe are perfect. If anything, pointy toe is less on trend. I’m starting to lose track of what is going on in this world. I read stuff on here about what is not in style and I just have no idea…like cuffed pants. Then, I see people wearing them. But yeah, the straight to the ankle skinny crop thing seems to be the thing now. I think. I think the triangle toe shoes are now on trend. Not super pointy, but straight across the front. I think I only have hidden platform shoes…the ones you can’t tell are platform and are only like 3.5″ high.